How important is plant diversity? Most ecologists think it’s a critical component of resilient ecosystems. Last week I collected some data that lends support to that view. In some experimental prairie plantings we’ve established in our Platte River Prairies, plant diversity appears to be suppressing the invasion of poison hemlock (Conium maculatum). A floristically rich restored prairie, in which prescribed fire and grazing are being used to maintain high plant diversity. The Nature Conservancy’s Platte River Prairies, Nebraska. Back in 2006, I established some research plots in our Platte River Prairies so we could take a more experimental approach to our work to understant how plant diversity affects prairie ecosystems. Those research plots consist of 24 squares, each of which is 3/4 acre in size. Half of those plots were planted with a high diversity seed mixture of about 100 plant species. The other half was planted with a lower diversity mixture of 8 grass and 7 wildflower species. Since then, several university researchers have helped us collect data on the differences between those high and low diversity plantings. We’ve looked at a number of variables, including soils, drought response, insect populations, insect herbivory rates, and resistance to invasive species. An aerial photo of our 2006 diversity research plots. Each plot is 3/4 ac (1/3 ha) in size and is planted with either a high diverisity (100 species) or low diversity (15 species) seed mixture. Kristine Nemec, a recent PhD from the University of Nebraska-Lincoln, has done the bulk of the data collection and analysis from those experimental plots. A soon-to-be-published research paper from that work will report that plant diversity appears to be suppressing the spread of two invasive species: bull thistle (Cirsium vulgare) and smooth brome (Bromus inermis). 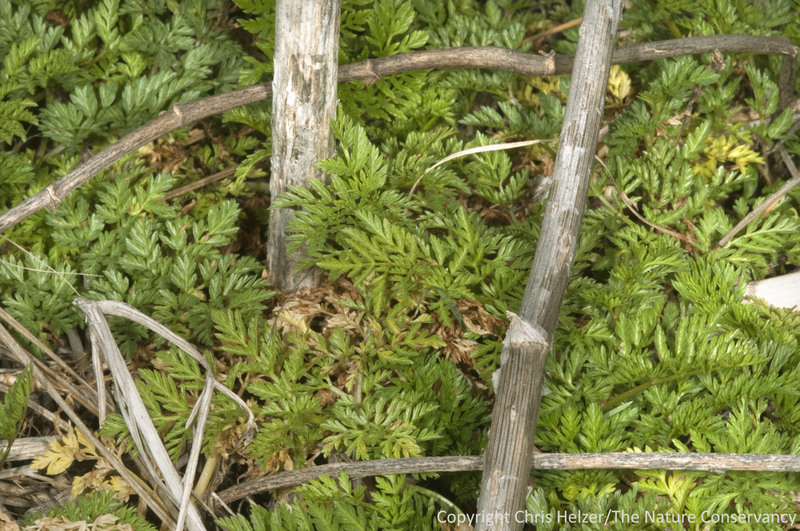 Poison hemlock wasn’t included in that project because the methods we chose for measuring vegetation weren’t well suited to capture its presence and abundance. However, from a purely observational standpoint, it’s always appeared that a lot less hemlock grows in the high diversity plots than in the low diversity plots. Last week, I decided to test that observation by collecting some data. Poison hemlock (Conium maculatum) has invaded portions of our research plots, sometimes forming large colonies that are near monocultures. Since hemlock is abundant mainly in the southern half of our 24 plots, I only collected data from those 12 plots for this pilot effort. Half of those 12 plots had been seeded with a high diversity mixture and the other half with a low diversity mixture. I walked three transects across each of those plots, and counted the number of last season’s hemlock stems that were within a meter of me on either side. I only counted stems that still had seed heads to help ensure that I wasn’t counting stems from multiple years’ production. You can see the results of my counts in the graph below. Although I haven’t yet run any statistics on these data, there is a striking difference in the number of poison hemlock plants between the two treatments. Hemlock was rare in the high-diversity plots, but was found in large numbers in many of the transects through the low-diversity plots. This was just a quick and dirty pilot effort to see if there was enough difference to warrant a full-fledged research project, but I feel pretty comfortable that plant diversity is having an impact on hemlock abundance. I plan to collect some more comprehensive data on poison hemlock this summer. I’d also like to collect the same kind of data from an adjacent set of plots we established in 2010. Those newer plots are the same size as those from 2006, but include three different seed mixtures: high diversity, low diversity, and a monoculture of big bluestem. If I see a similar pattern of hemlock abundance there, that will go a long way to confirm what I think I’m seeing in the 2006 plots. I’ve never considered poison hemlock to be a particularly dangerous invasive species in our Platte River Prairies. It seems to be most abundant in old woodlots, and doesn’t often show up in our native or restored prairies. On the other hand, the plant’s toxicity can cause big problems, especially from an agricultural perspective. In fact, we’d considered haying our research plots last summer but couldn’t find anyone to harvest them because hay containing poison hemlock can’t be fed to livestock. If prairie plantings with a high diversity of plant species resist invasion from hemlock, that could have important ramifications for farmers who want to establish new grasslands for hay or grazing production. 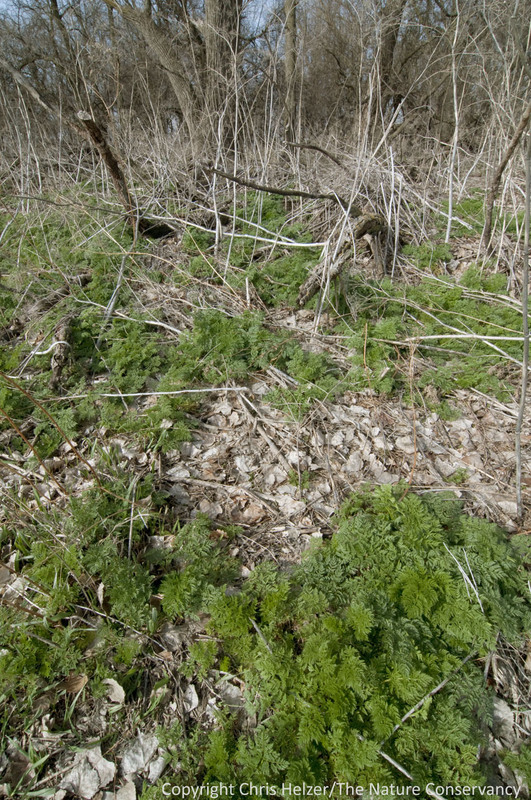 Poison hemlock is most often found in old woodlots along the Platte River. We don’t usually see it in our diverse prairies. My little pilot study is a small addition to a growing list of other research projects demonstrating the value(s) of plant diversity. 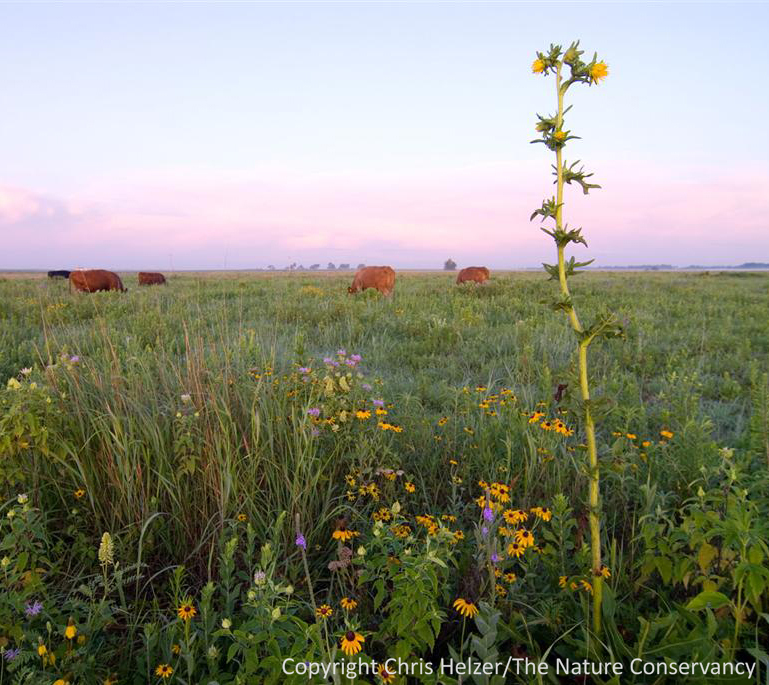 Unfortunately, high diversity prairie plantings are more expensive than lower diversity plantings, so it’s important for landowners and conservation organizations to know exactly what they get for that higher cost. High plant diversity provides nectar and pollen resources for pollinators, improves total vegetative production, and has other benefits, including quality wildlife habitat. However, one of the most intriguing aspects of plant diversity is its potential to help suppress invasive species. If we continue to find that more diverse plantings help repel species such as bull thistle and poison hemlock, that will have important implications for both agricultural producers and wildlife/prairie managers. This entry was posted in Prairie Natural History, Prairie Plants, Prairie Restoration/Reconstruction and tagged conium maculatum, data, diverse seed mixture, grassland, nebraska, plant diversity, platte river prairie, poison hemlock, prairie, prairie planting, prairie reconstruction, prairie restoration, prairie seeding, research, seed mixture, species richness, value of plant diversity by Chris Helzer. Bookmark the permalink. Chris, I have relevant data from 2009 and 2010. Conium followed the same pattern as all exotic species combined in my study. Looking at non-drought samples, it was less abundant on low richness plots (not observed on high richness plots), but it was also less abundant on low seeding density plots (about 14% cover on low density and 3% cover on high density). Both the high seeding density and high richness plots have greater small-scale richness and cover of native species…my hunch, given the phenology of growth and flowering of hemlock, is that fuel in those treatments has allowed prescribed burns to more negatively affect hemlock in addition to any effects of competition. The effect in that experiment, of course, isn’t exactly richness either, because all high and low richness plots draw from the same species pool. There could be one or a few species that are clamping down on the hemlock that are unique to the high richness mix (a portfolio effect). Thanks Dan. I haven’t looked at the seeding rate aspect yet – initial glance didn’t show quite as stark a difference. As you say, it’s hard to know whether the total species richness is more important than the presence of a species or two that competes very directly with hemlock. Either way, I think species richness is important, because it’s hard to predict with native plant species will compete against any particular invasive species, so the more natives are included, the better chance we have. Oh, I’m not arguing against rich seeding…if richness or species identity have the same effects, then doesn’t matter outside of academic arguements. I would also note, if I remember correctly, that there is either a north to south or northeast to southeast gradient where there is more hemlock to the south and west (the south part, while farther from the river, is a little lower and wetter). Given the design of the experiment, it would be prudent to use experiment row as a random effect. Also, gathering accompanying data on small scale (<=1m2) richness of seeded species might give some insights…for instance, maybe you could find a richness-hemlock abundance relationship along gradients of richness within treatments. Your results are striking. I certainly like the outcome that diversity resists invasion. A couple of questions, was the herbaceous layer consistent and uniform over the entire plot area prior to planting? Were all the plots planted at the same time? 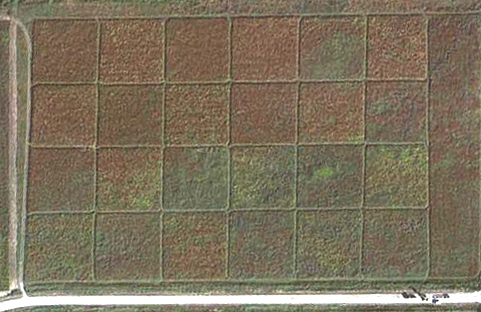 Were adjacent test plots planted in high and low diversity mixes in a checker board pattern? David – good questions. Sorry I didn’t include all the details in the post, but didn’t want to bore people… Yes, the plots were all seeded into cropfield, so it was a uniform starting point. The plots were all planted on the same day and checkerboarded. We have soils data that we can do some correlations with at some point as well – at first glance, I’d say hemlock appears to be most abundant in soils with higher organic matter, but it’s hard to say for sure. The northern plots that I didn’t sample tend to be the sandiest soils. Bull thistle and poison hemlock are both host plants for a couple of abundant species of butterflies, painted ladies (Vanessa cardui) on the thistle and black swallowtail (Papilio polyxenes) in the case of poison hemlock. I wonder what impact, if any, introduction of a number of larvae of these species would have on the two plant species. Dan – good question. We have strong numbers of painted ladies and a few black swallowtails around. I don’t know if swallowtails are using the hemlock or not – I’ll have to keep my eyes out for that this summer. Chris – do you do anything to try and control the hemlock or just hope the natives suppress it? I was hand weeding today using hedge shears and cut the flowers off a patch of hemlock. After reading up on it afterwards it might not have been the smartest thing to do. Sounds like getting the juices on your skin and eyes can be nasty. Mike – We control it in selected situations where we think we can get it early before it becomes established in a new site. Most of the time, we’ve not worried about it because it doesn’t seem to be overwhelmingly invasive. In a site like yours, it’s probably worth some attention because you have a small enough prairie you’ve got a good chance of eradicating it. And yeah, don’t use your bare hands… you don’t want that stuff on you. We’ve just spot sprayed it with Roundup because we’re usually working in very young restorations where not much else has established yet – but I’m sure there are other options.